This edition will be fairly short as I had a trip to Manchester for two days and so have lost part of the time I normally use to produce the page each week. I did really enjoy my trip but have to mention one incredibly frustrating aspect of my journey. I spoilt myself and booked a round trip on Virgin trains from Euston to Stockport in First Class. At the time of booking, some three months ago, one is invited to book a seat on each journey. Well, that's a mess I must say! I requested a window seat with table facing engine on each journey and was blessed with seats which had very limited views and in the return journey facing backwards. Now, you would imagine it would be easy to change the seats. No, it is not and my registered complaint to Virgin Trains, made on February 24th, has yet to receive a suitable reply. Any invitation to speak to us directs one to an agent in India who seems to know less about the trains than those travelling on them. I cannot complain about the days of travel and I was easily able to move to a seat which was to my liking. I do have to ask why one cannot get through to someone in the British Isles to speak to when the level of service was not to ones expectations? Sorry Virgin but I am not impressed. Well, that's enough of my Victor Meldrew impersonation and lets get on with this week's news. 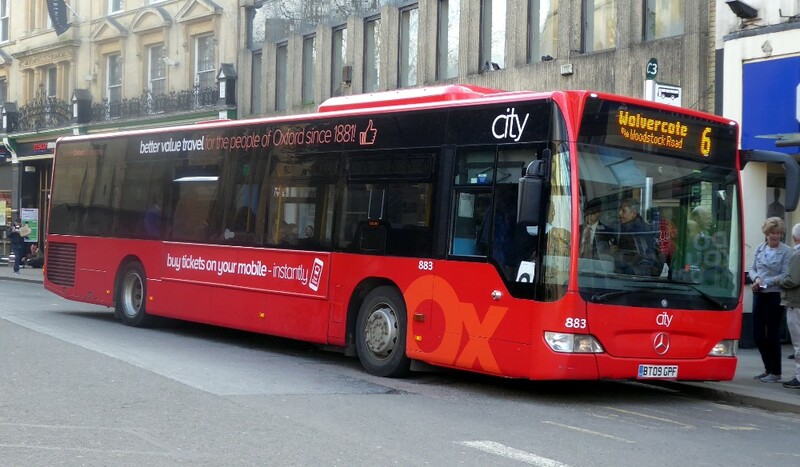 It seems that both Oxford companies are having quite some problems with vehicle availability and this is seemingly why the buses one expects to see on each route are falling short of the mark. One supposes that this a short term problem and matters will soon get back to normal. The past week has seen two separate incidents with PCV fires in the southern part of our area. 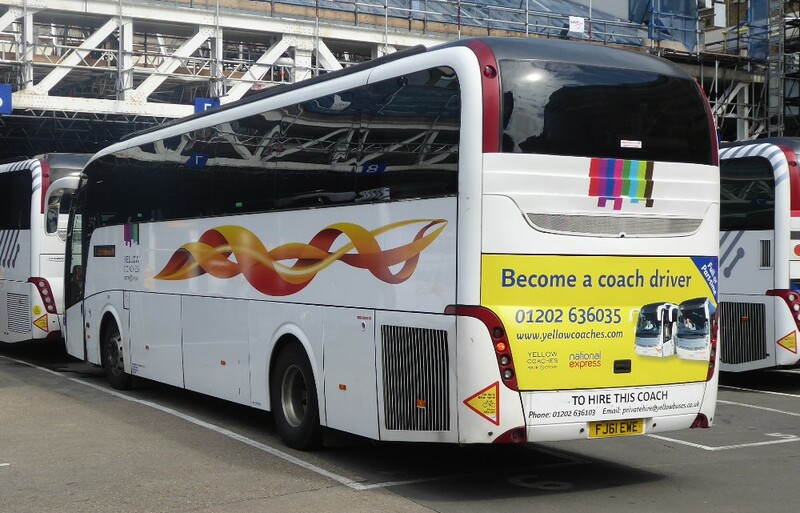 A coach caught fire on the M40 near High Wycombe on April 15th – with 30 people on board. Firefighters from High Wycombe and two officers were called out to the northbound carriageway between J4 (Handy Cross) and J5 (Stokenchurch) at 4.51pm. Bucks Fire said thankfully all 30 people on the coach were “accounted for”. Crews used one hose reel, two sets of breathing apparatus and a thermal imaging camera to tackle the flames. Traffic was stopped while firefighters dealt with the incident. Fire in exhaust system of single-decker bus, Rayners Avenue, Loudwater. Passengers had to be evacuated from Arriva 4517/KL52CWJ on the morning of April 17th after a fire broke out. The blaze started in the exhaust system of the Arriva bus and happened close to a bus stop on the London Road, near Rayners Avenue. Two fire crews from High Wycombe were called to the scene just after 9am, but the fire was out by the time they arrived. Everyone on the bus - ten passengers and the driver - were evacuated safely. Thankfully there were no injuries on either vehicle but it is worrying that such events can occur. 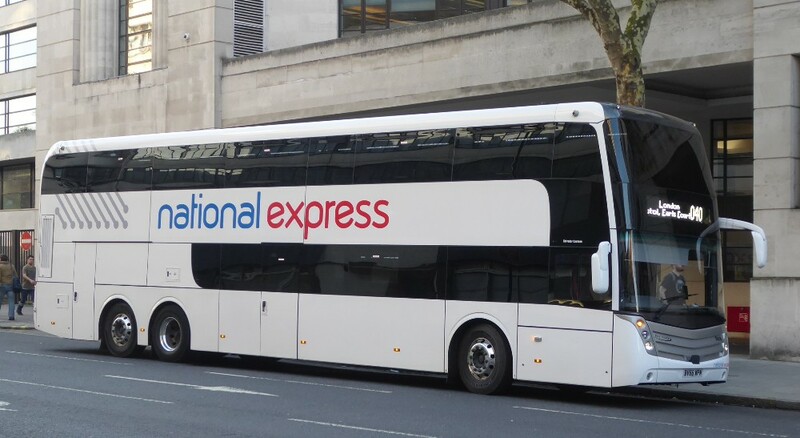 The company has blamed 'congestion' and increasing journey times for having to increase fares on its buses. 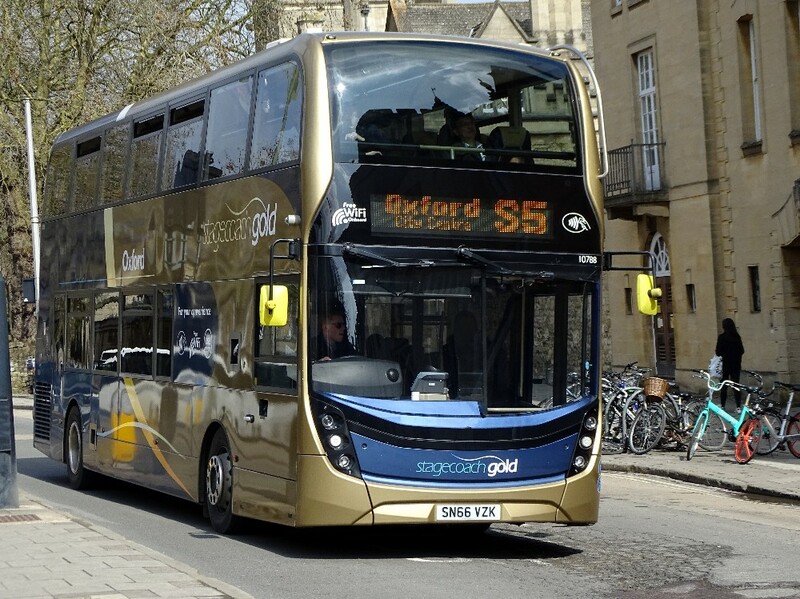 Stagecoach confirmed that prices will go up in Oxford with single fares increasing by 10p and returns by 20p. On the Oxford Tube service to London prices will also rise for the first time since 2015, with a single going up by £1. Return fares have been cut by £1 but the cheaper next day return option has been scrapped. 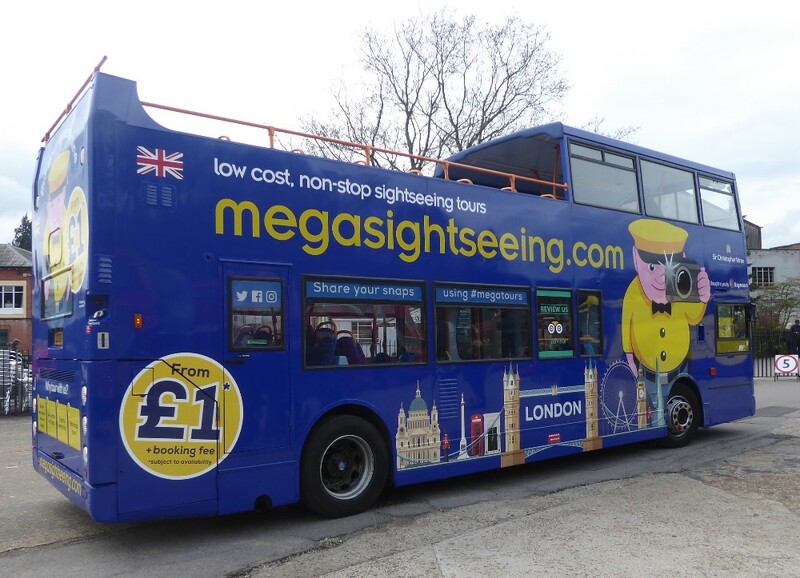 The company said it was freezing the cost of other tickets including the '7 day megarider' and introducing new deals. 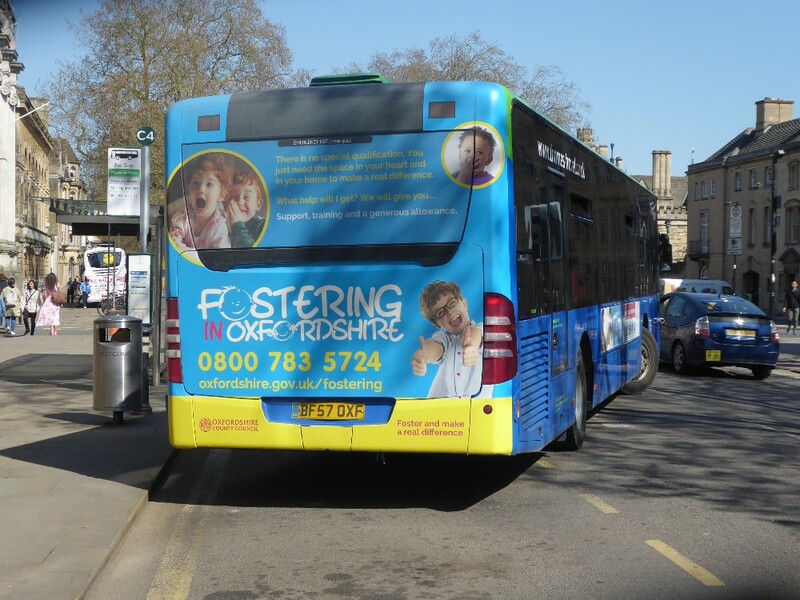 Children will now go free on 'connector' tickets which allows travel on local services to connect to and from the Oxford Tube stops. Other changes will also see a group ticket changed to be valid for three adults who can travel together at the discounted price. The changes will come into effect from Sunday, April, 29. On the Oxford tube some fare increases are planned for April 29th as noted above. Memories are made of this! I found some interesting pictures which I needed to scan. So sorry, not the best but I hope of interest. Citylink Metroliner C908GUD 908 loading for the return journey to Oxford when seen in Victoria Coach Station, gate 10, on October 21st 1989. Taken by your Editor who had travelled up and back on this coach. They were rather nice coaches but seemingly most unreliable and, I was Told, that COMS never got all eight on the road in any one day! sometime in the late '80s when caught on camera by Malcolm Crowe. 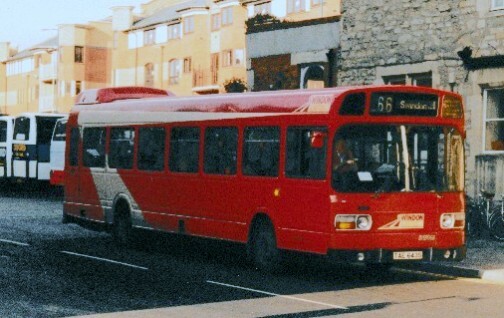 This bus was new to Bristol Omnibus as 3061. Again sorry about the quality but somewhere in Cornwall I caught this ex COMS VR with Western National OUD436M again in the late 1980s. It seems this moved to Milton Keynes later with Buckinghamshire Roadcar retaining this livery which was a lighter blue than seen. A Guided Busway up north! 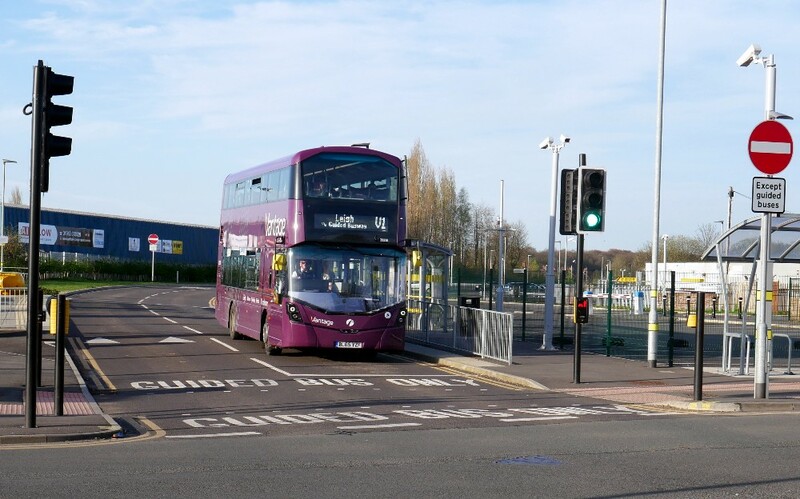 First Vantage Guided Busway Volvo-Wrights seen having left the Busway and entering Leigh , 39238 BL65UYZF on April 18th by Malcolm Crowe. 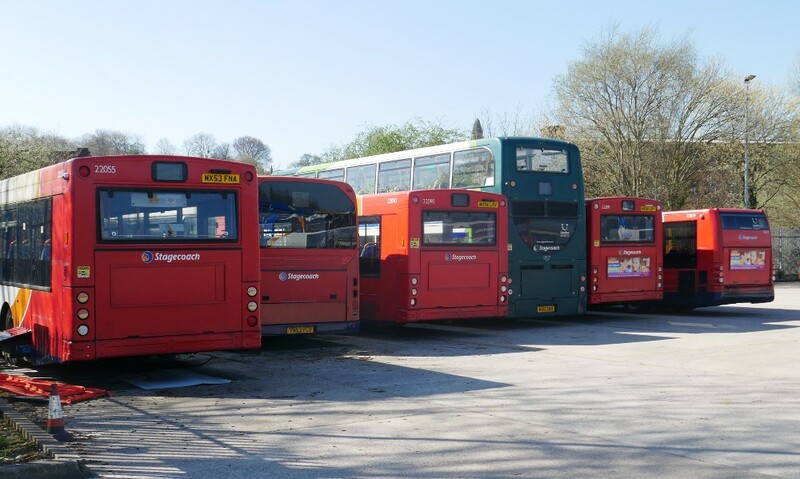 S4 Banbury – Deddington shorts (at present every hour to make a 30 minute common frequency with Oxford buses) to be withdrawn Mid May. 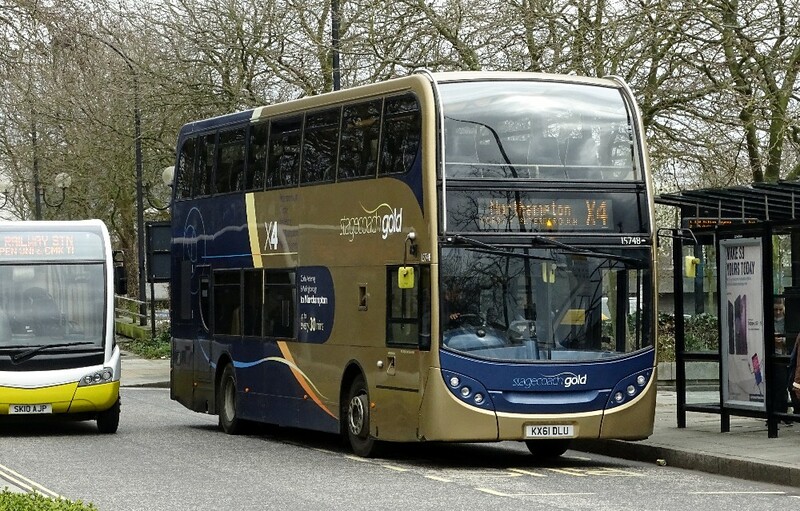 Kidlington Assisted Travel have been operating the B1 but this is no longer listed on Traveline. However they are now planning more local services that were withdrawn when the County withdraw all subsidies. Geoff Cunliffe remembers his youth following my article on Tree Loppers last week. "I note your comments about overhead tree damage and the accidents which can occur. As you know, I was born in Blackburn and spent my first six years living on Preston New Road. 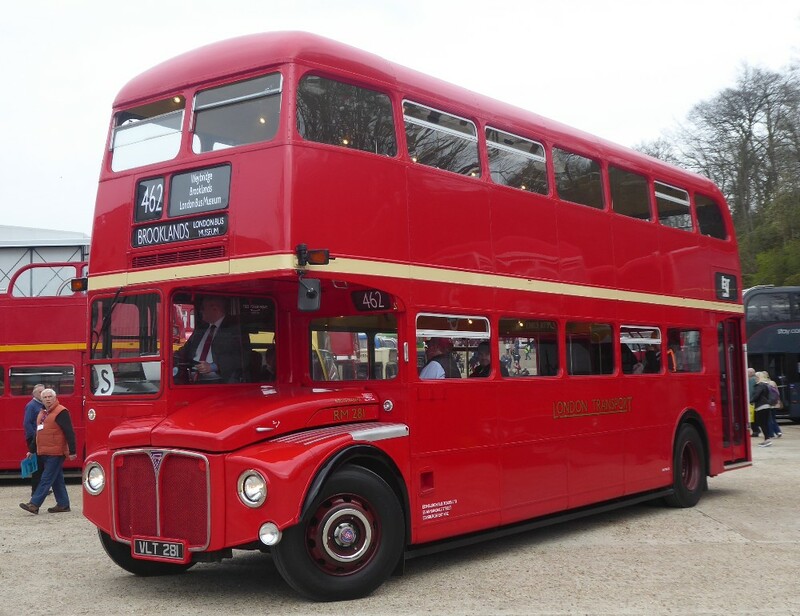 I am pretty sure my love of buses came from the fact that, during the war, the overwhelming majority of vehicles passing our house were buses since petrol for private cars was so scarce. Although young, I still have a memory of a Ribble tree lopper, with most of the top deck removed above waist height, coming down the road, with two or three men cutting branches of varying sizes from overhanging trees and storing them on the top deck. I think the bus had a gauging loop at the front of the top deck. That was about 1945. 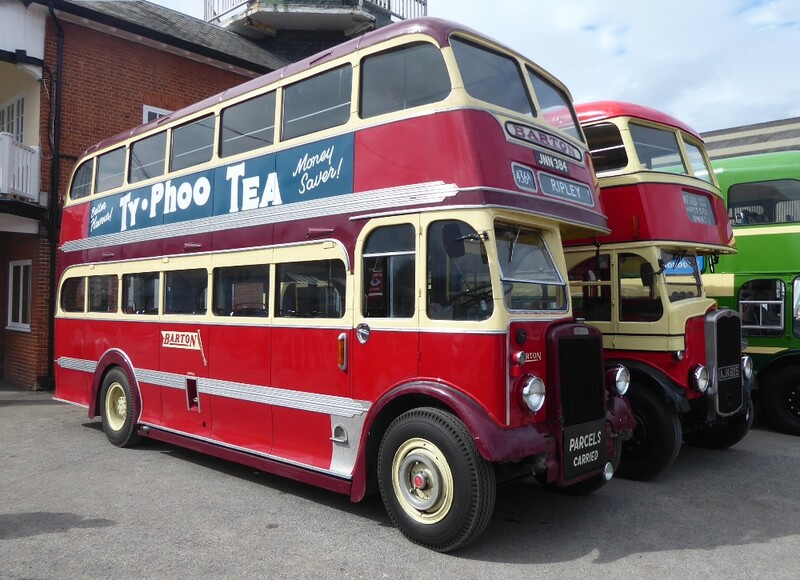 I have never found reference in any Ribble fleet histories to a vehicle converted for such use but I guess it was probably an old TD1.How’s that for a memory?" 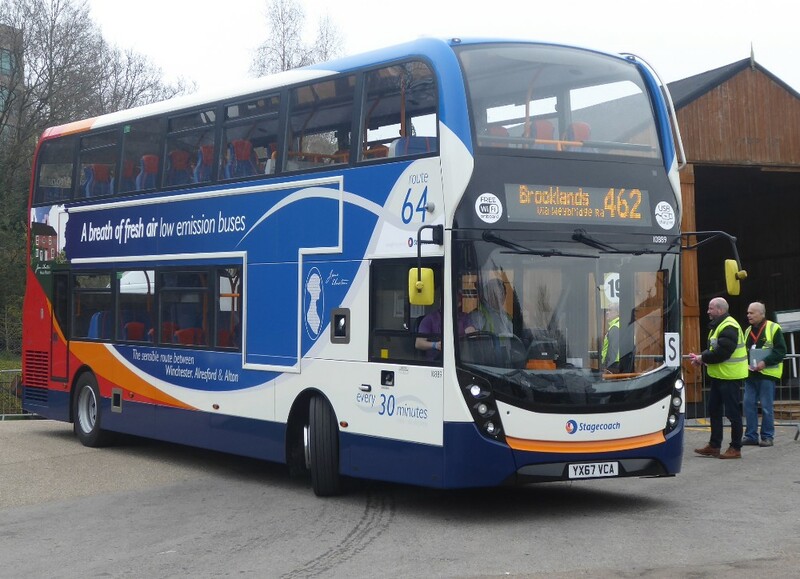 "Firstly catch up on local events, Stagecoach Midlands, Kettering are revising the X4 from late May, and its being withdrawn south of Northampton (the MK section). 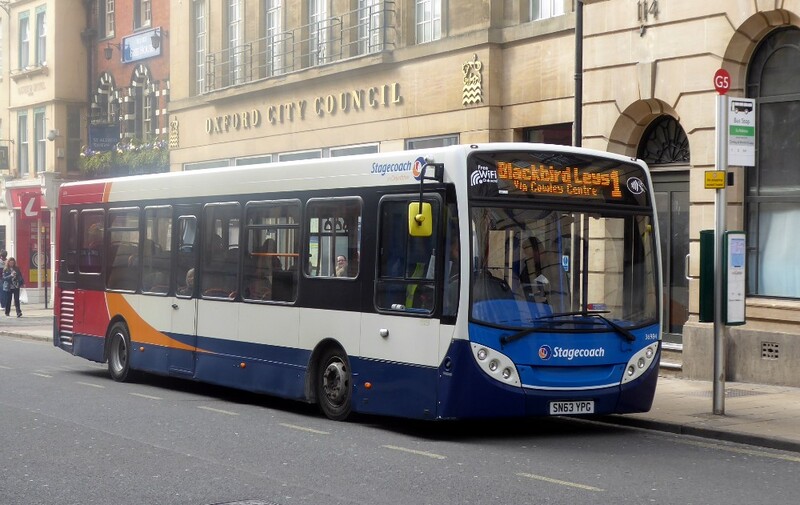 The shorts between Northampton and Corby are to be incorporated with the 26 from Oundle (via villages) to Peterborough to provide a 30 minute frequency throughout. Unsure but I think they should be able to use Gold's to cover this. At the same time the X7 MK-Northampton-Market Harbro-Leicester is going every 30 minutes throughout, so in effect replaces the MK section of the X4. 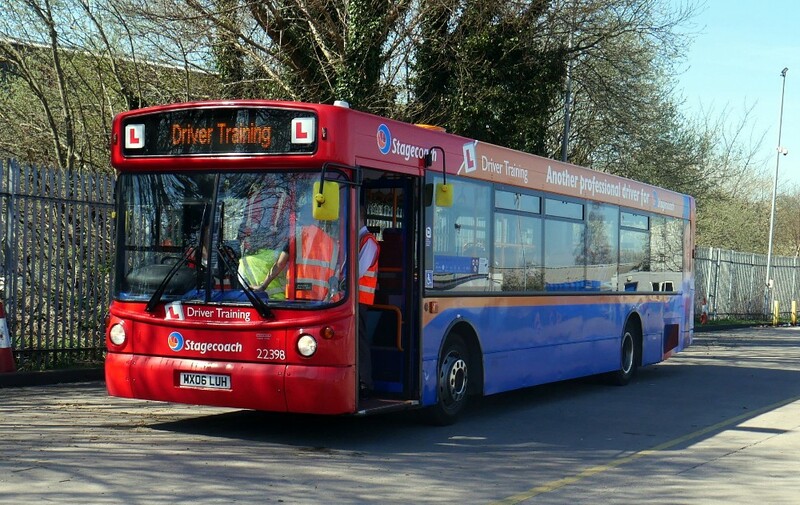 Grant Palmer and Centrebus were involved in a major head-on on the unguided section of the Luton Busway on April 9th with Grant Palmer's Scania 151 BU51WAY and Centrebus 705 K2YCL, both appear write offs, and both drivers were badly injured. This leaves Grant Palmer with no spare Busway vehicles at present. 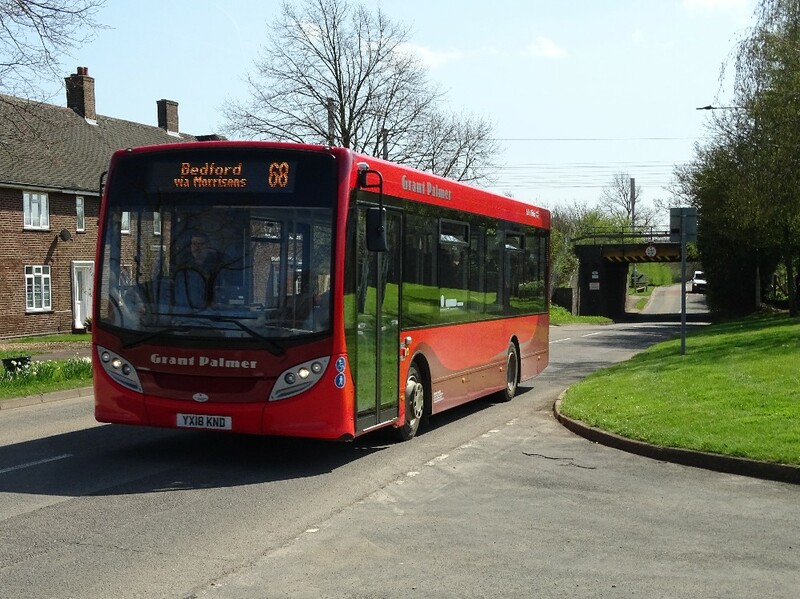 Grant Palmer has two new Classic E200 into service recently and one is seen in attached photos working a recent extension to the 68 route between Bedford and Stewartby which now has some journeys extended to Ampthill. 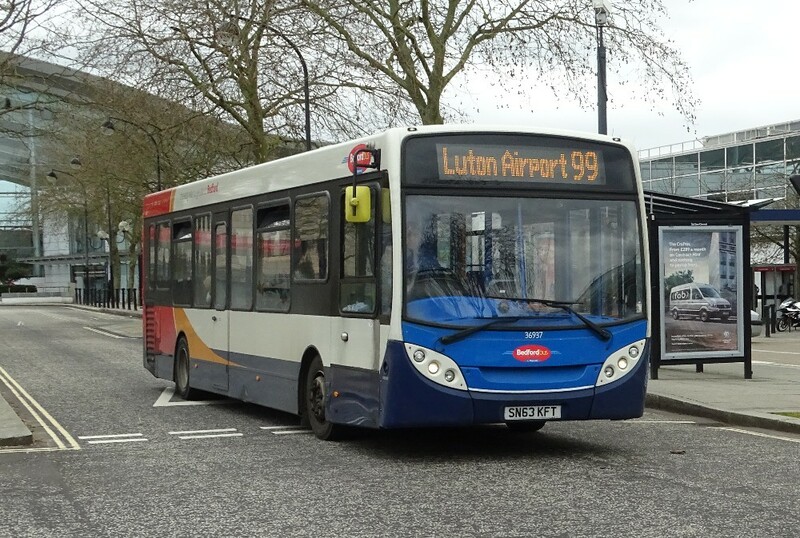 The 99 between MK and Luton Airport via M1 has seen E200’s in place of Panthers. Attached are a few shots from MK on Tuesday plus a new GP on the 68 !" 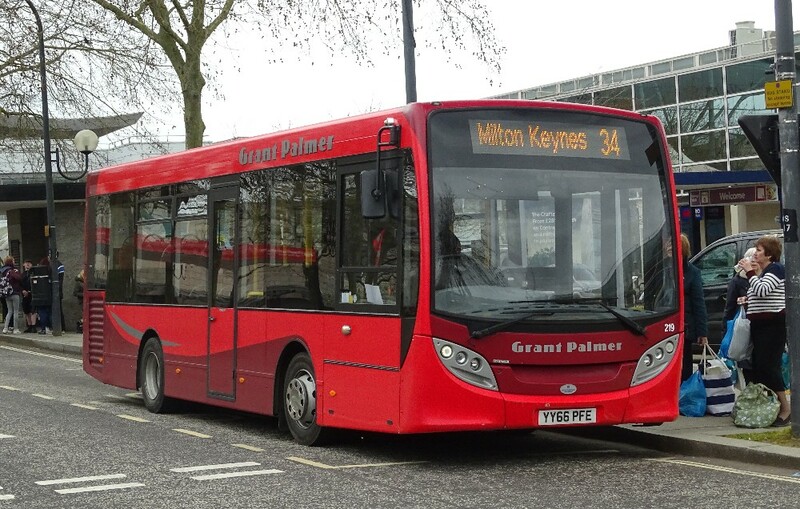 Grant Palmer 219 YY66PFE works the 34 in Milton Keynes. 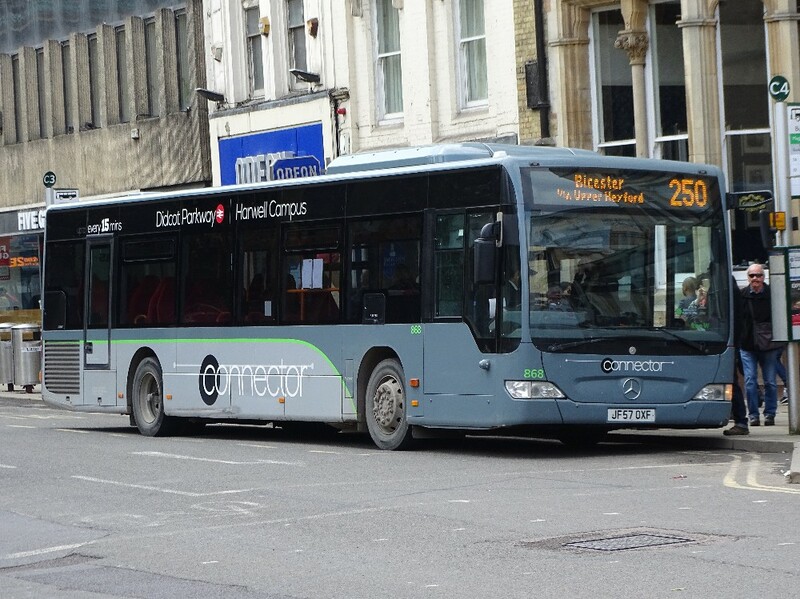 Readers may remember I was looking for picture of new E200s with Grant Palmer and above is YX18KND with the 68 between Bedford and Stewartby. East's 36937 SN63KFT at Milton Keynes Station working the 99 to Luton Airport on April 17th. This is normally a DP working. Northampton's 19010 MX06XAK works the X91 at Milton Keynes Station on April 17th. 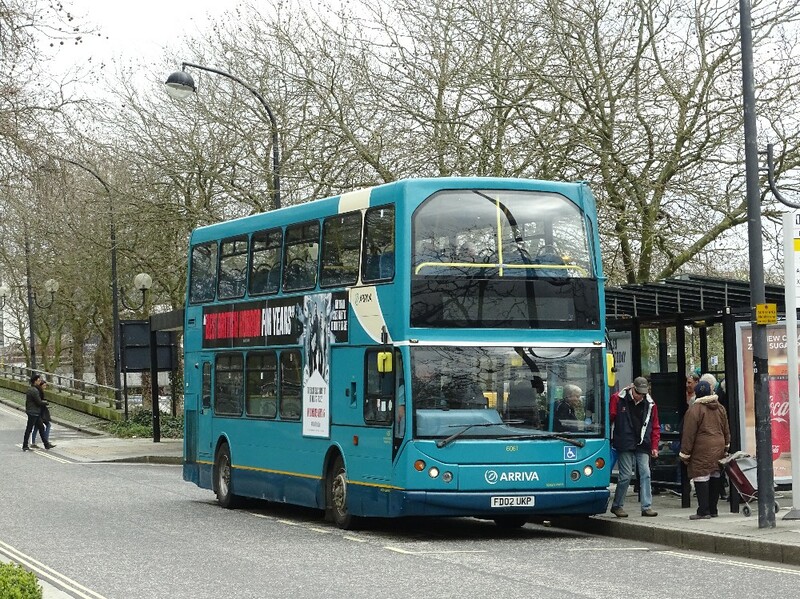 Again Northampton's 15196 YN64AOG works the X91 at Milton Keynes Station on April 17th. Soon to be but a memory at Milton Keynes Station, Gold 15749 branded for the X4 and based at Kettering on April 17th. 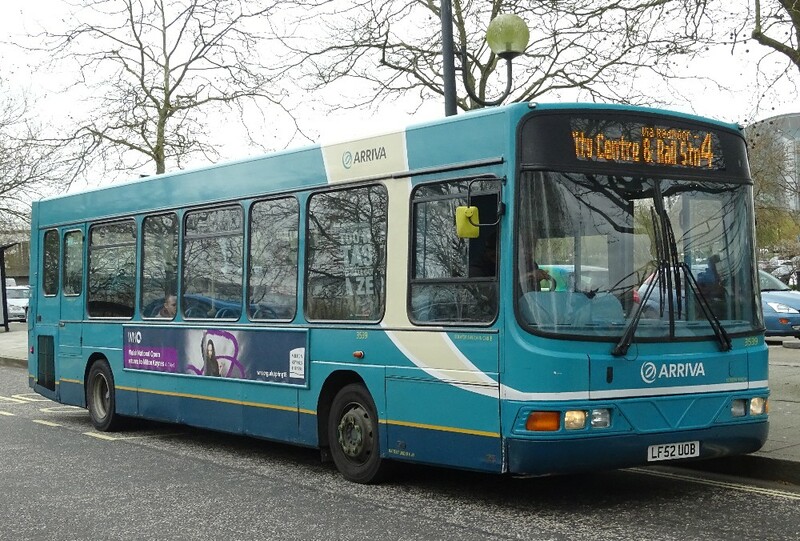 Another route 4, this time Arriva. MK's 3539 LF52UOB at Milton Keynes Station on April 17th. Arriva The Shires DAF DB250 6061 FD02UKP, ex Arriva Midlands 4279, at Milton Keynes Station on April 17th. Arriva Trainer 9558 AE56MDV once 3747 at High Wycombe and branded for the "Blue One" now seen at Milton Keynes Station on April 17th. Readers may remember that in week 6 we saw 9555, once 3743, in High Wycombe. 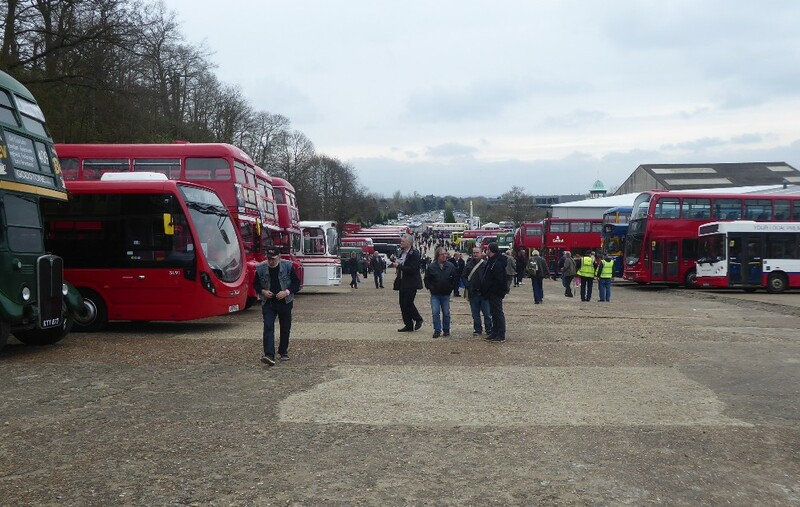 Gavin attended the event a week last Sunday, April 15th, held each year at Brooklands. Many pictures will be around of the vehicles at the event and so I have chosen a selection of those I hope are of interest to readers. Two general views of this year's Brooklands. That new double decker from Courtney YX18KNC was providing a shuttle service. It is still very white and not so far branded in any way. 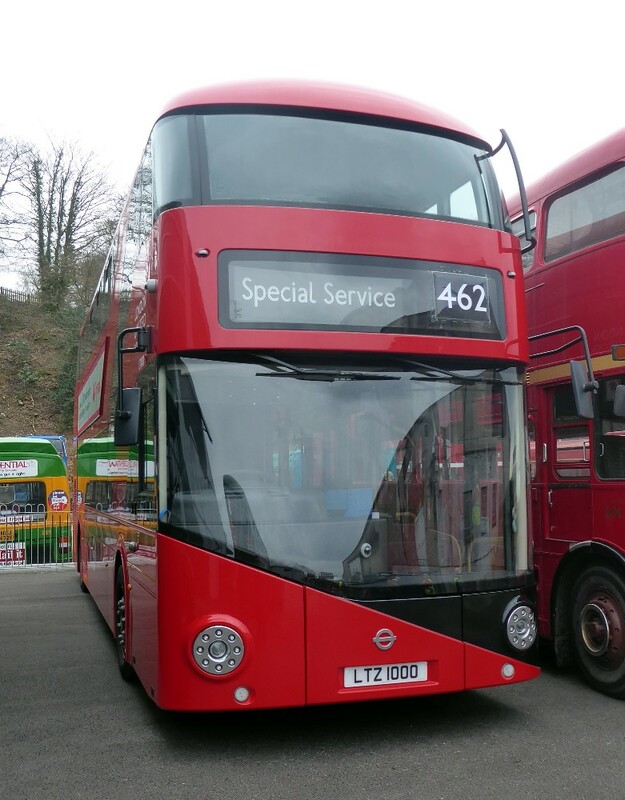 An important milestone was reached recently when the final New Routemaster entered service being LT1000 LTZ1000 the registration matching the fleet number,. This has to be a preservation candidate one day, I wonder how long that will be? 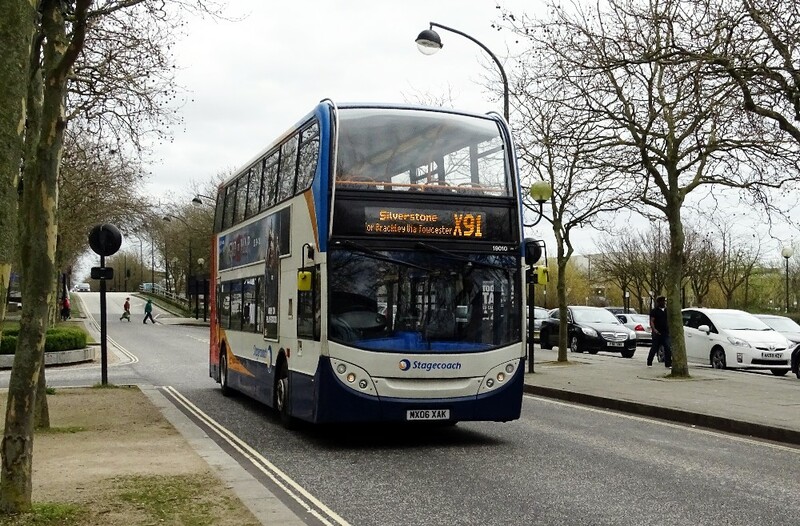 Stagecoach South's 10889 with route branding for the 64 serving Winchester. 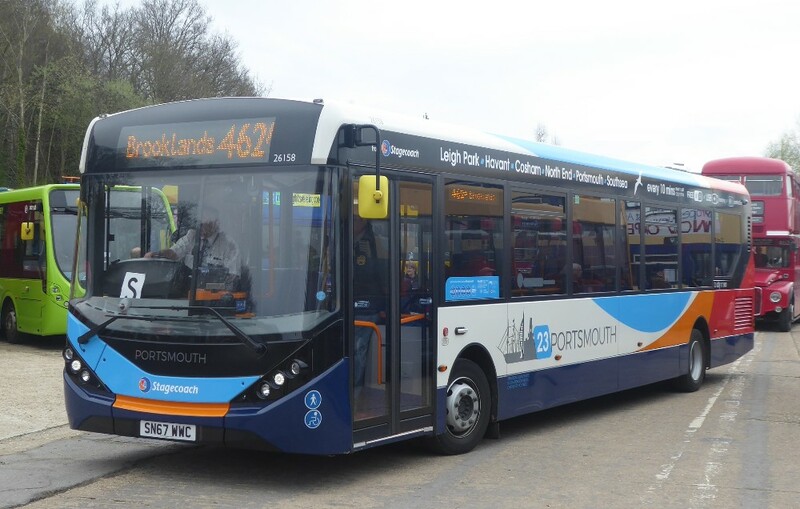 Again Stagecoach South, this ADL MMC 26158 SN67WWC, what a shame the W's weren't M's, branded for the 23 in Portsmouth. 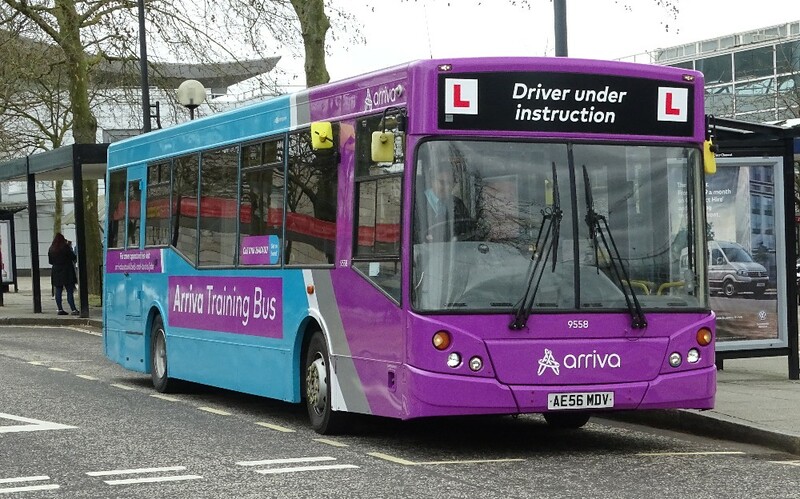 Rather local to us, Arriva's 1021 hails from Hemel and was on show to provide interested parties with an opportunity to see the "new" minibus concept. In the days when designers seemed to be able to provide rather interesting and even unique buses, this Barton Leyland decker looks rather splendid. Barton's JNN384. Air travel in the '50s and 60's often included connecting coach services from city terminals and BNEA and BOAC were no exception. 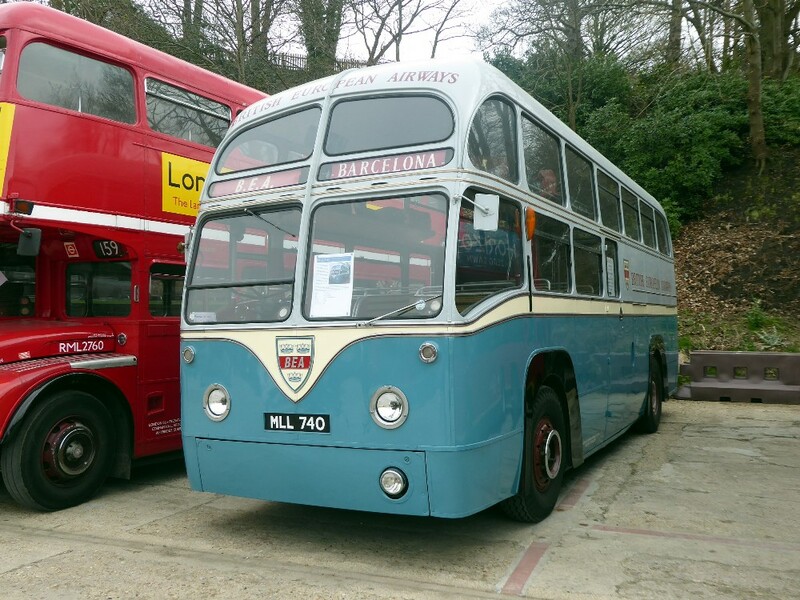 BOAC actually borrowed a Ribble White Lady Atlantean to try before ordering their own decker. BEA had the half deck coaches which allowed ample luggage room. 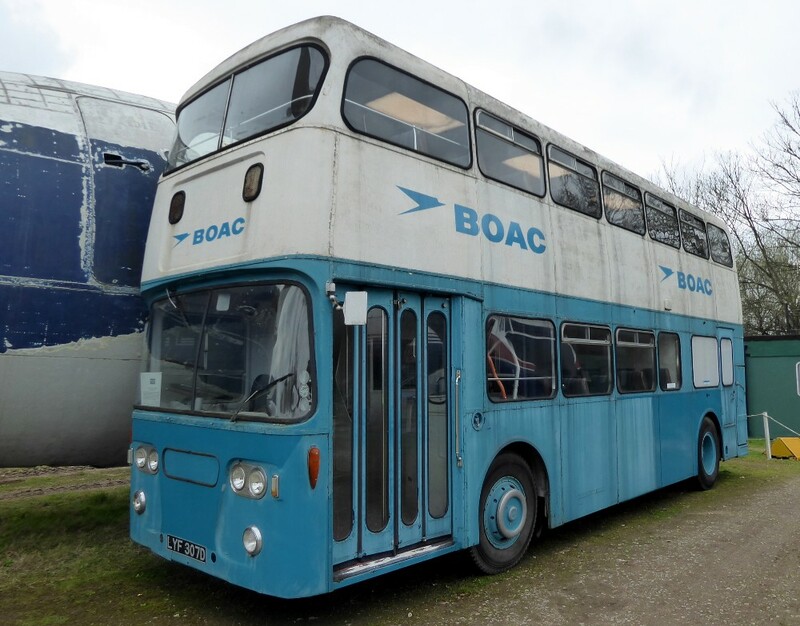 Sadly the BOAC Atlantean looks rather forlorn doesn't it? Reading's contribution was ADL 221. 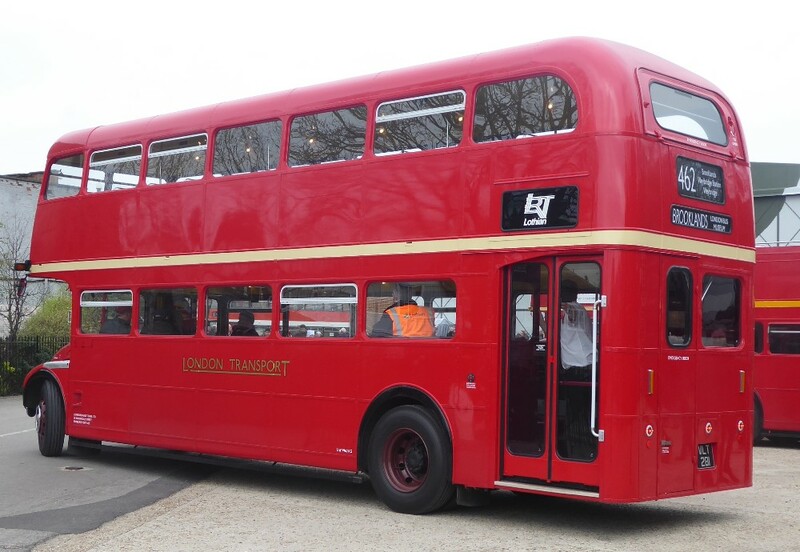 A significant surprise attendee was this extended Routemaster RM 281 with a full bay rather than a small middle day. It looks most impressive. Gavin said this bus was a real credit to its Lothian owners and must have cost a lot of money. 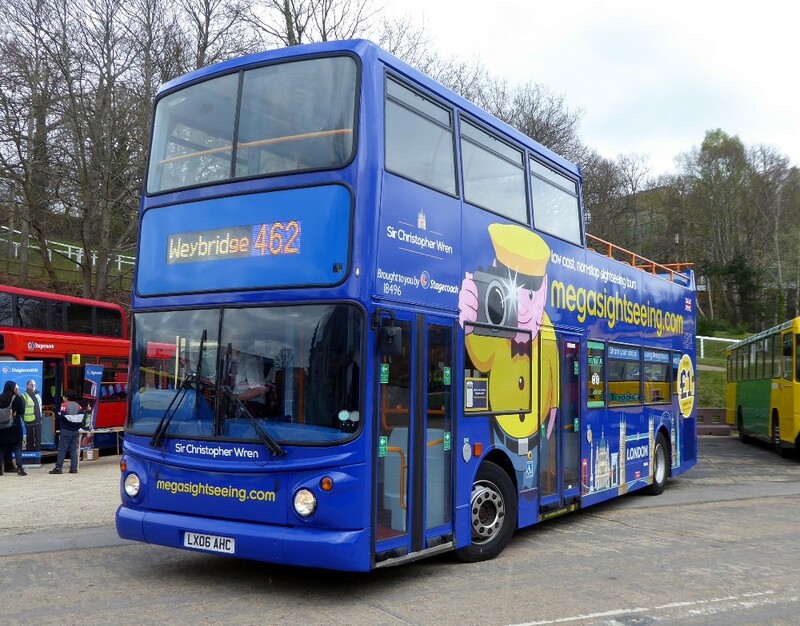 Not surprisingly Stagecoach sent one of the new open top ALX400s newly prepared for megasightseeing. This one carried the name Sir Christopher Wren who designed St Paul's Cathedral. He also designed the Sheldonian Theatre, Oxford somewhat closer to home. As always very comprehensive and reasonably priced. 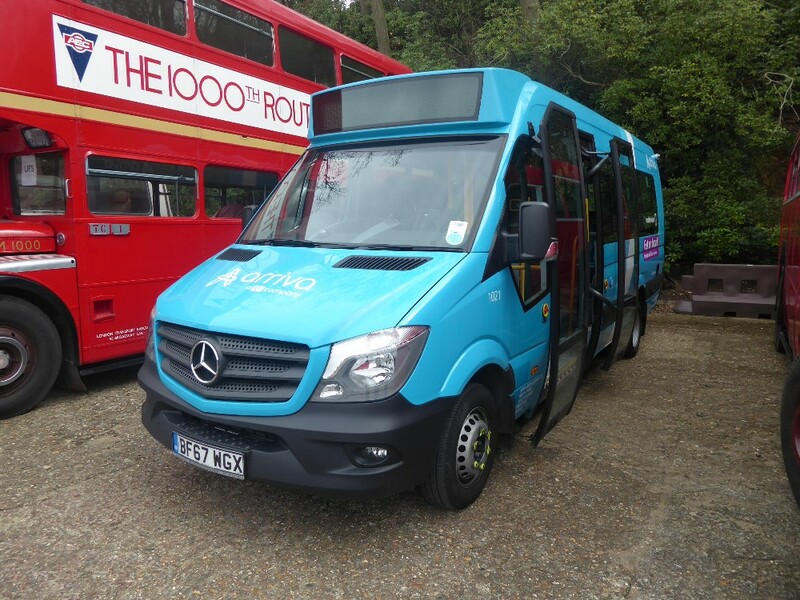 To compare with 709 in its present guise check back to when it first arrived in Thames Travel livery. Seen here by Gavin Francis on April 19th in Stokenchurch. I notice that Alpine of Llandudno has an ex Oxford coach EB07OXF which was nr 85, first in Airline livery and then in X90 grey livery. After service with Oxford worked for Hamilton as HIG5338 on Megabus services suitably liveried. After leaving Hamilton it seems that it moved to Alpine who have once again provided a cherished registration for the coach which is now XFV257. So this is a coach like Jacob in a coat of many colours!! Must try and get a picture when I go to Bangor in early June. 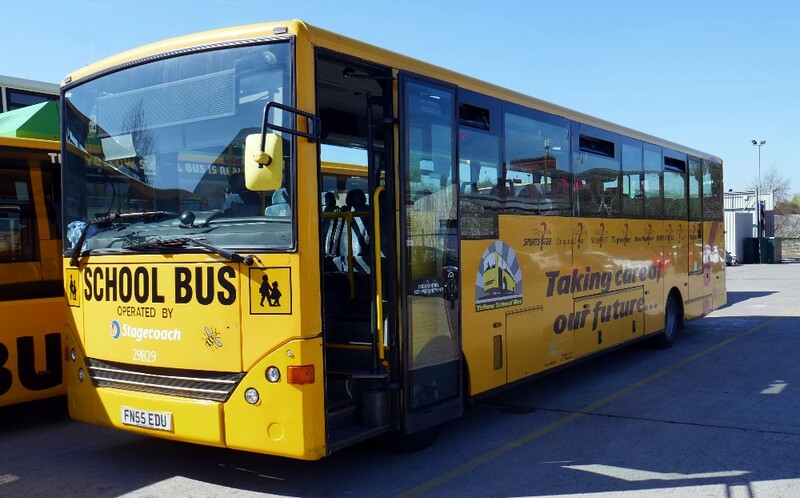 The goings on with de-branded Park & Ride 662 is, I learn, intentional and there is a plan for an overall wrap to be applied. So Guys "keep your eyes peeled"! 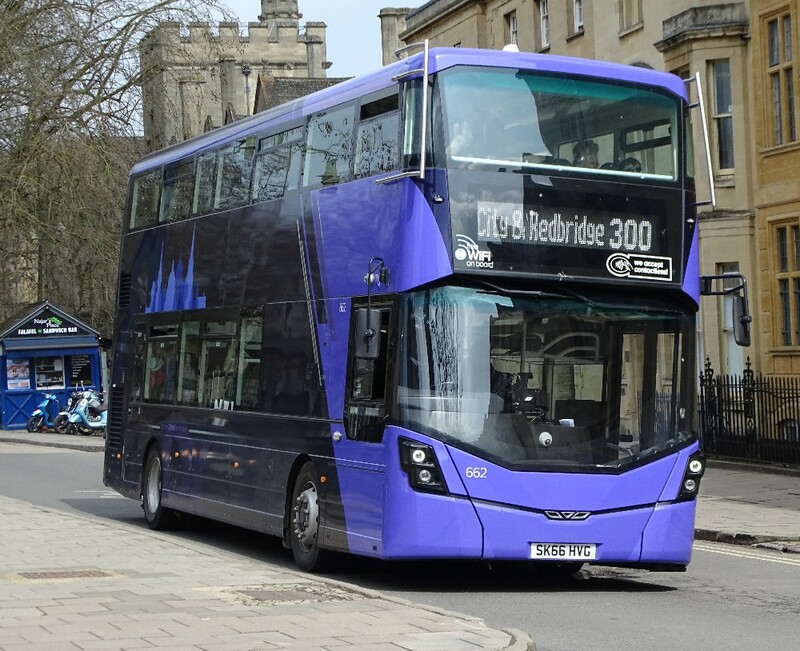 Ralph Adams writes "It appears that Oxford were short of buses on Monday as Route 5 (I card) was operated by 856 – this is a Thames Travel blue & green Citaro. However, there are three more buses that come into service after I card. Again, a strange allocation as I card is out all day (and it was the same bus all day – from a friend who was watching them all day) and K card was a normal double deck. K card is only a peak bus, the last one out in the morning and spends all the mid-day period in the garage." "As expected 201 has lost its City logo at the front." 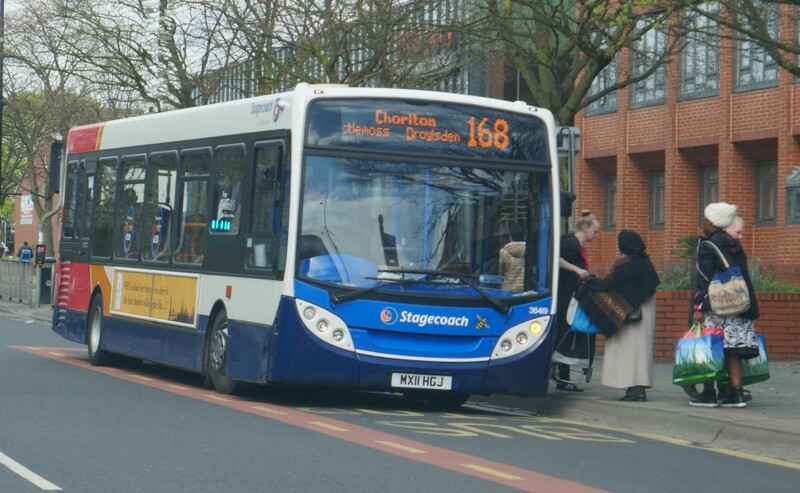 Citaro 883 was working the 6 on April 16th. 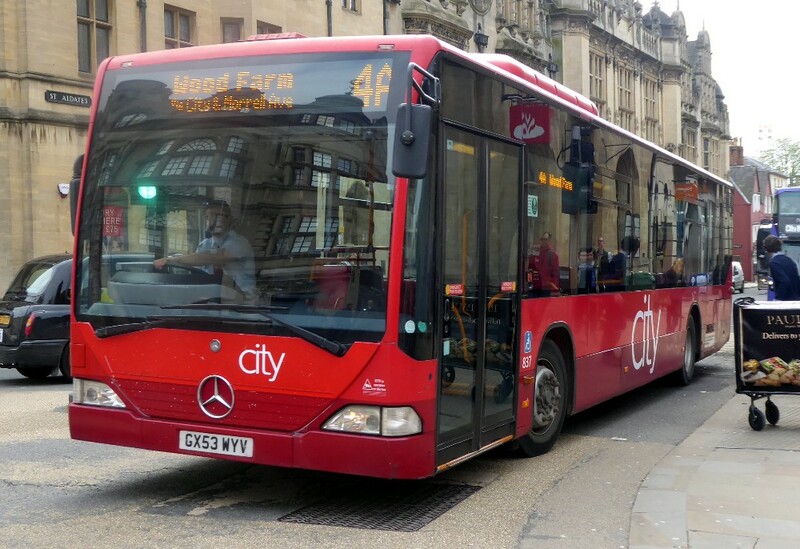 And on April 17th, one time Carousel Citaro 837 was working the 4A seen here in St. Aldates. 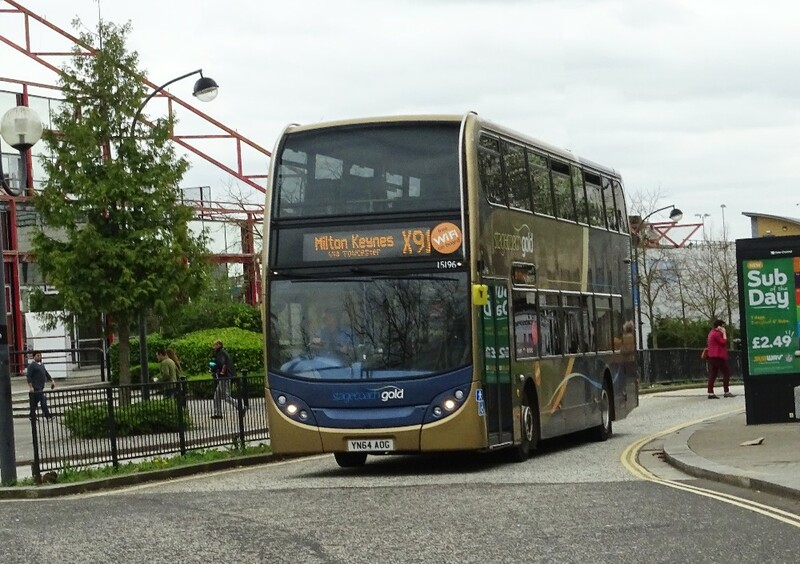 Gavin advised that a Citaro was working the 5 today, April 23rd. 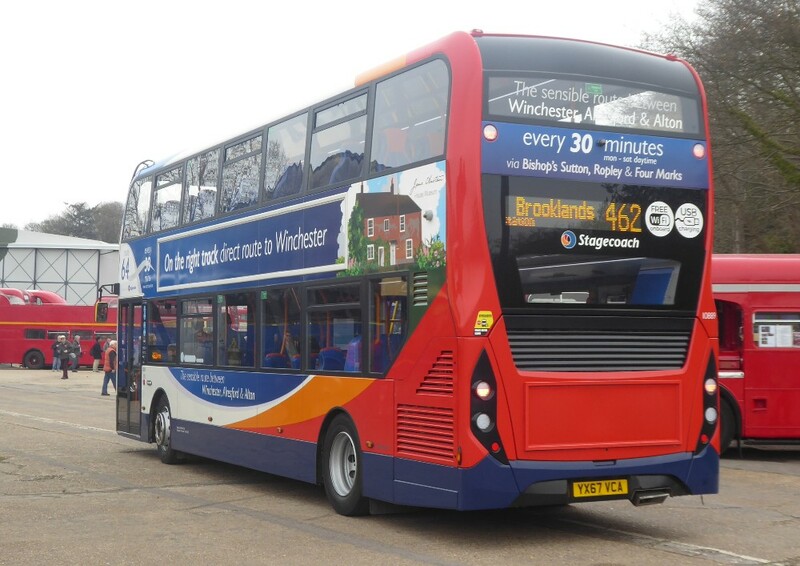 Another picture of de-branded 662 working the 300 P&R service on April 14th seen by Richard Sharman. 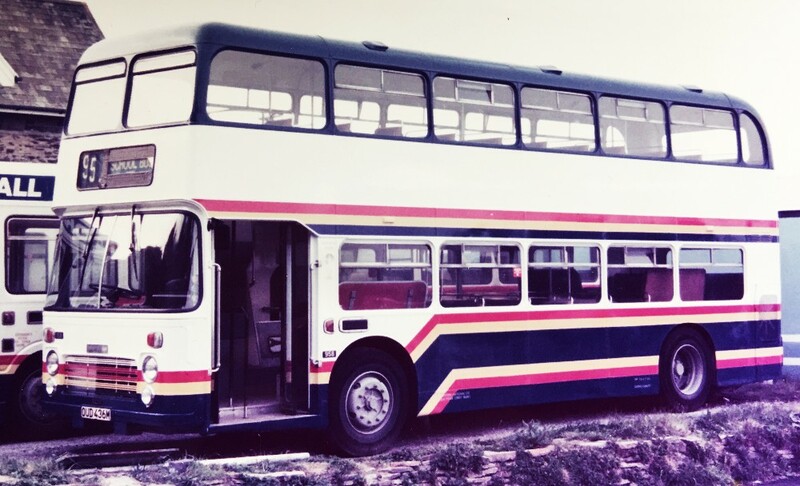 "The 94S (normal 94 bus with school diversion) also requires a double deck, 212 used today – used to fluctuate between single and double deck. 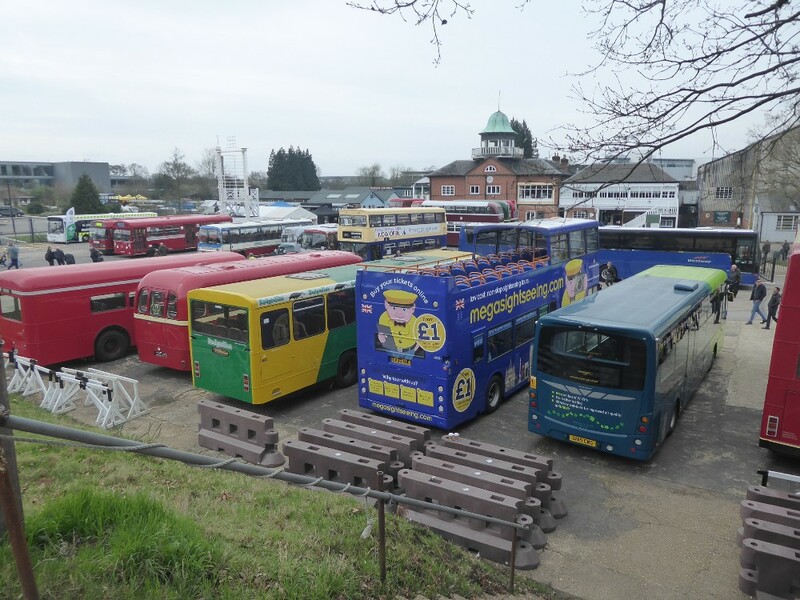 The other buses on Didcot school service today were 213, 253, 934, 864, 208 and 912." Of interest is the apparent renumbering of the 25A service to Bicester as 250. We wonder why? 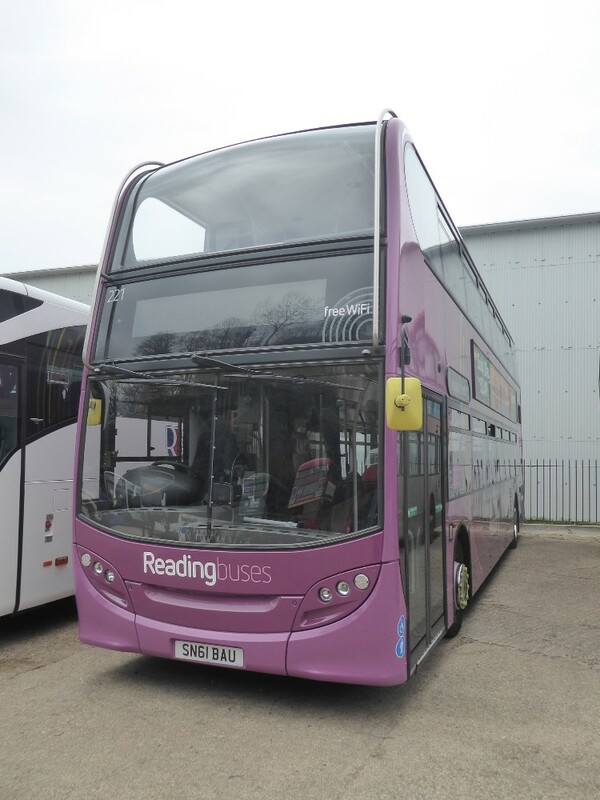 Citaro 868 works the renumbered 250 Service on April 14th by Richard Sharman. 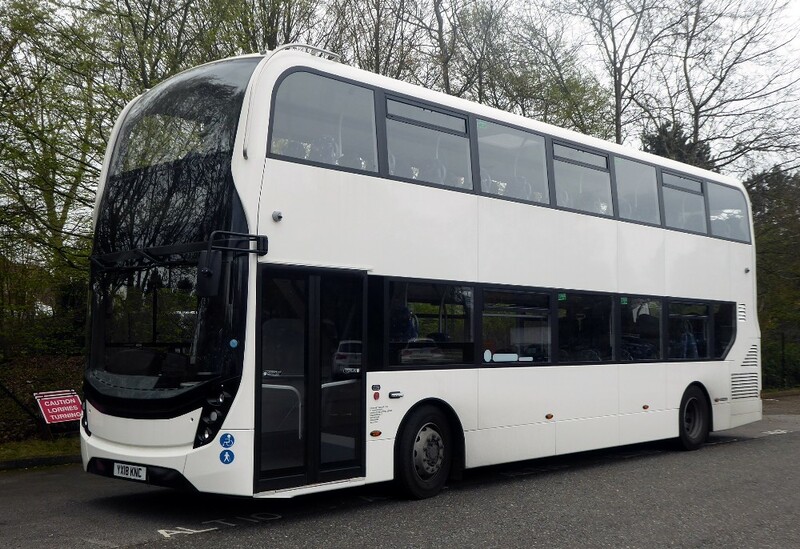 Thames Travel Citaro 861 BF57OXF with recent super rear seen on April 20th by Gavin Francis. After a lengthy period of not being seen in service, it would appear that the Caetano deckers are back with us. Edwards BV66WPM seen working the 040 opposite VCS on April 20th by Gavin Francis. Gavin is interested to know why Rotala (Bournemouth) are looking for drivers in this rather novel way? It appears that the group is much involved in retiring the once large M A N fleet. On a short visit to Manchester last Wednesday and Thursday I visited Ashton depot and saw several examples withdrawn and expected to go to Wigan for storage prior to sale. Others are being converted to trainers. Pictures are shown below. Several M A N s are shown above out of service and heading for storage at Wigan. I don't think the Hybrid is out of use. Another use for the M A N fleet is as driver trainers, SC Manchester's 22398 MX06LUH at Ashton depot on April 19th. 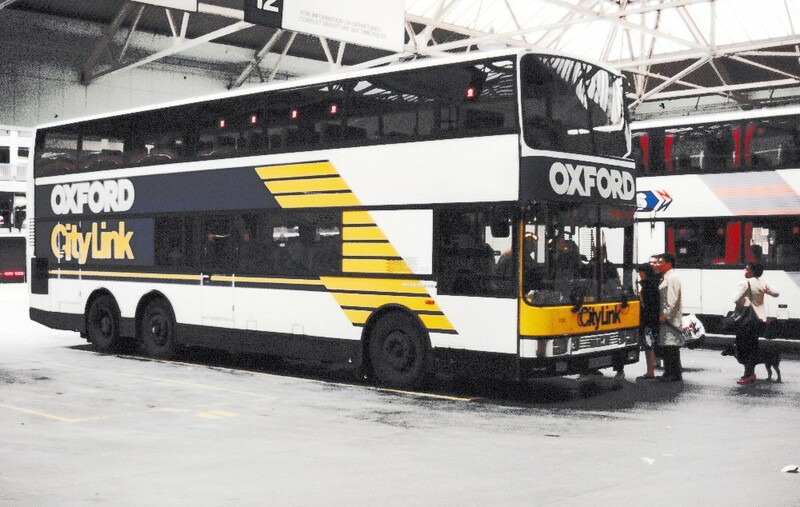 This has a certain local interest as Oxford was one of the very first companies to have a fleet of M A N buses with ALX300 bodywork. Also I was unaware that the small bees seen on the front dash of most buses are now being removed. They were applied following the tragic explosion at the Manchester Arena a year or so ago. Pictures shown below illustrate the bees. 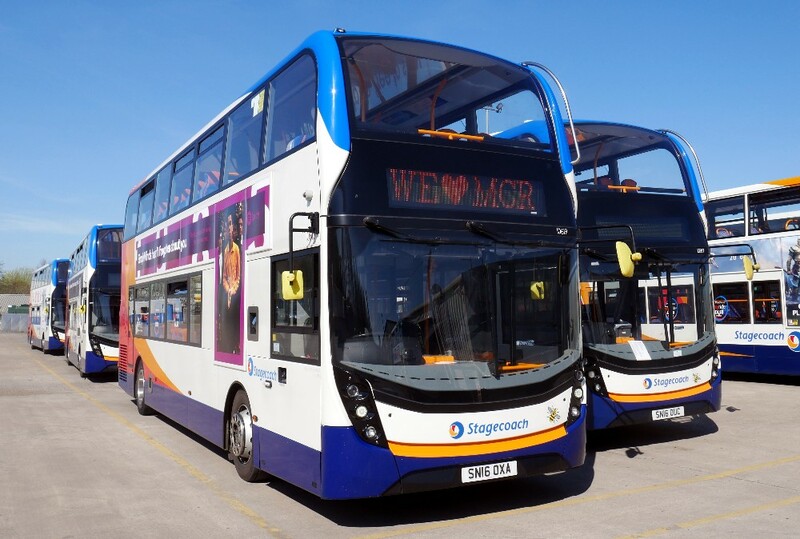 Ashton is also the home of ADL MMCs allocated to the 330 route between Ashton and Manchester Airport. The airport and cargo centre are only served at peak times. 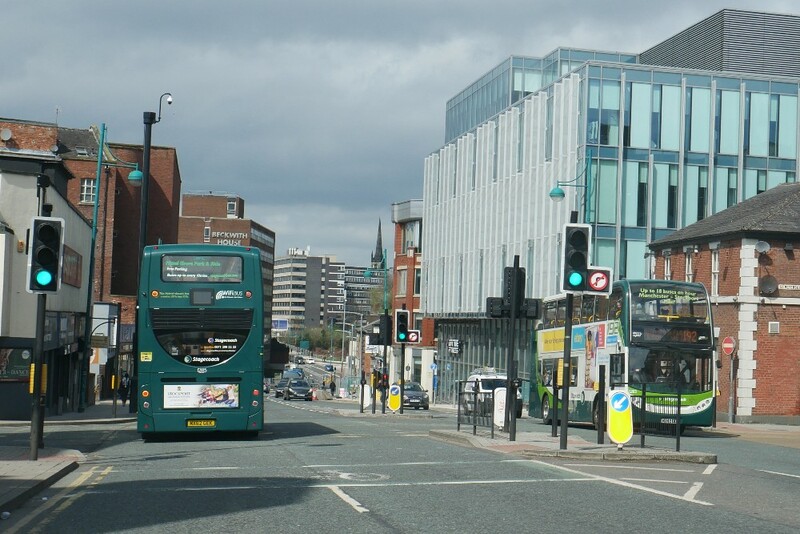 Otherwise buses terminate in Stockport. 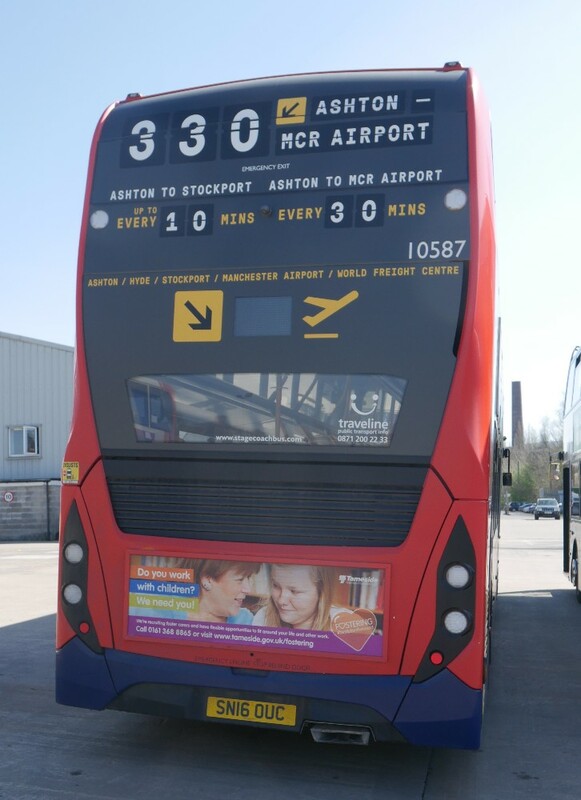 An important route for Ashton is the 330 with branded buses using an airport information board style of presentation. As an ex long term Airline man it took me a few minutes to work out the style!!! 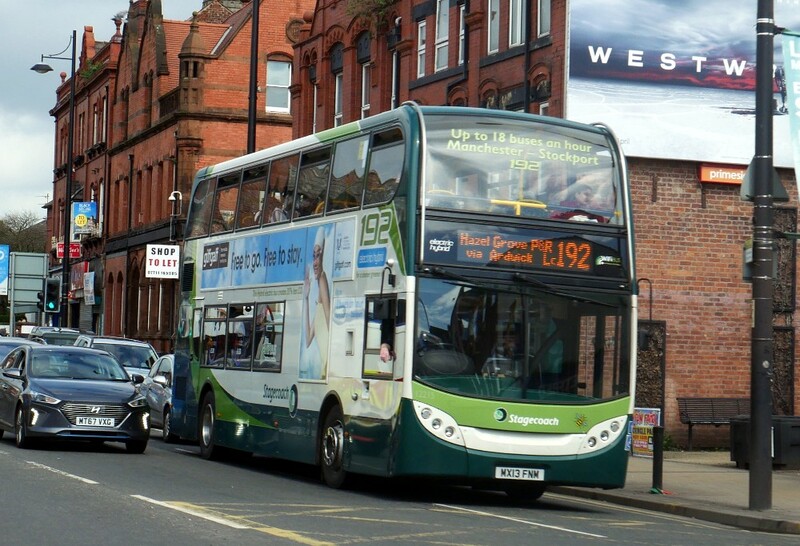 The 30 was once the Ashton route to Stockport many years ago before the area lost its local companies. 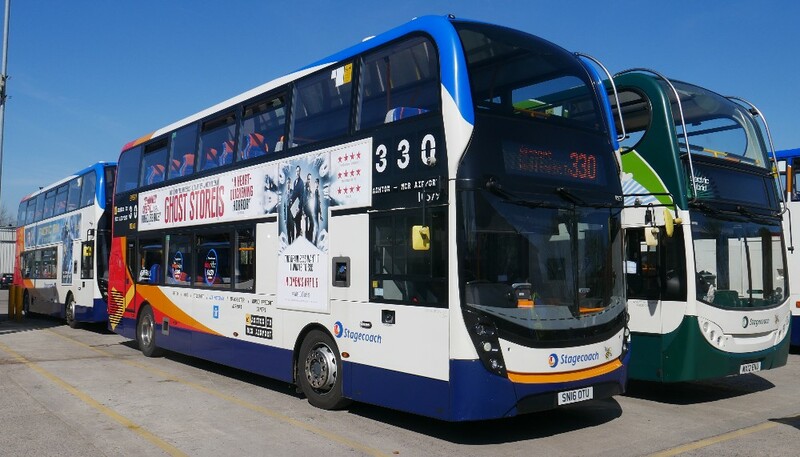 Scania DP 10587 is seen at Ashton depot on April 19th. and was shown the destination screen appearing on all buses when out of service and same being an alternating display. What a nice touch! ADL MMC 10619 again at Ashton depot on April 19th. Coming out of Stockport Station with my host, Les Burton, I was greeted with this view of Lancashire Hill. Hybrids 12185 and 12183 on the very frequent 192 service from Manchester to Hazel Grove via Stockport. Don't let Southerners tell you it always rain in Manchester!!!!! You can see from my pictures it doesn't. Hybrid 12215 another on the 192 along Stockport Rd noting up to 18 buses an hour. It also looks to have a good load. 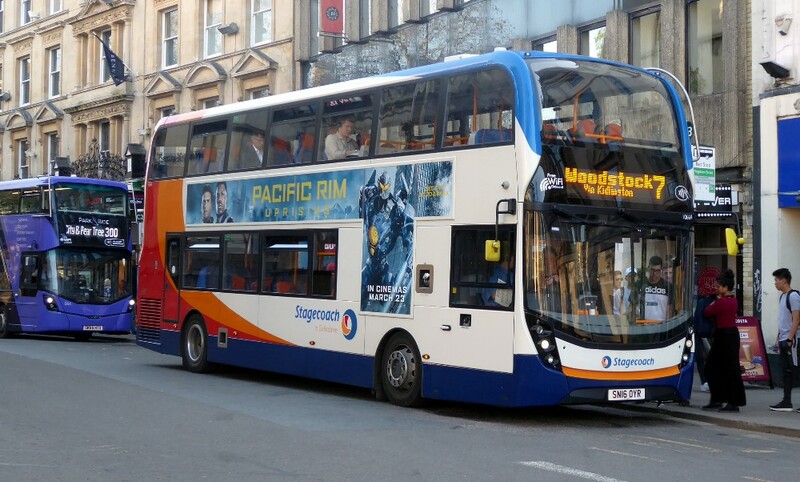 Finally a more Stagecoach looking bus on a local route, the 168 and it is E200 36419. 25324 A Versa school bus at Ashton depot basking in the sun between duties. These are 57 seaters. 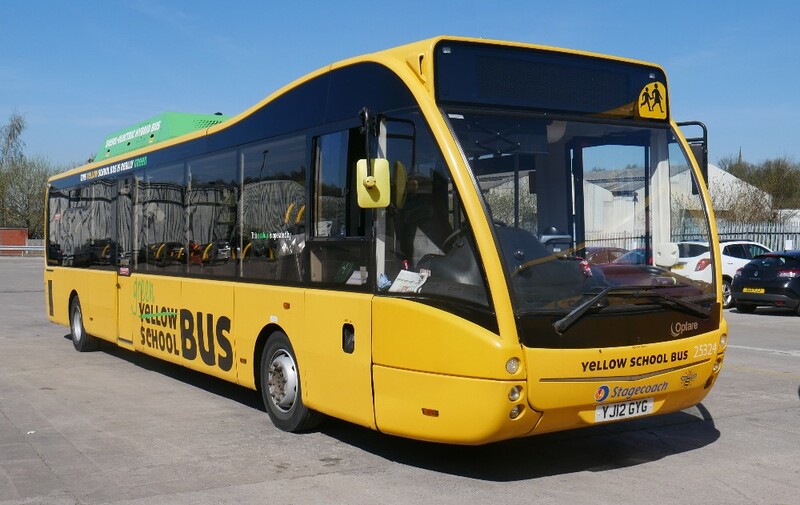 Another yellow bus, this time 29829 an Irisbus Scolarbus at Ashton depot. These are very high off the road with very steep steps to enter! Ralph Adams advises "Recently a white top 10439 was in use on S3 instead of a Gold. Normally there is at least one Gold on the city routes but none out, so must be a bit short of Golds. Note the run out sheet did not include the 700 so unaware what might have been on that." MMC 10669 works the 7 on April 22nd by Gavin Francis. Very unusually E200 36984 is seen with a 1 in St. Aldates on April 17th by Gavin Francis. 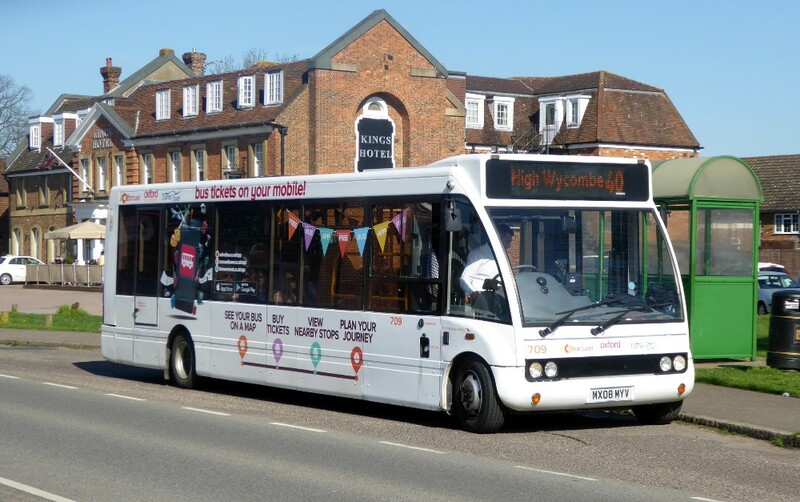 A nice newer one of the S5 with 10788 working the route on April 14th when seen by Richard Sharman. Well, apologies to other who have contributed but I have run out of time and will include remainder next Sunday. Also sorry for the 24 hour delay, there are not enough days in the week!!! !